My son is on a let-me-cook-everything-for-myself kick since the baking of the cookies on Monday. 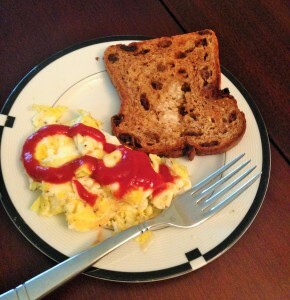 He made his own breakfast and even said I should take a picture for you. If you are wondering why there are no berries on his plate, it is because I am struggling this week to locate strawberries and blueberries at a decent price. In fact, the only container of blueberries I bought so far this week is so small (and pricey) that I am trying to portion control in order to make them last. I guess this is how we know where we are in a season without even looking at a calendar. I even stopped putting blueberries in my pre-run breakfast and have been utilizing my banana supply instead. With a mixed spoonful of Cranberry Apple Butter and the new Trader Joe’s Crunchy Peanut Butter with Flax and Chia. I save the few blueberries I allot to myself for when I get back from my run. I have also been slowly going back to relying on frozen berries as in my favorite Very Cherry Blend because they are always available and convenient. Not as great as fresh, although, I can live on the frozen cherries just fine and especially like to seek them out after a sweaty run before jumping in the shower. Let’s talk convenience foods for a bit. At least, my idea of convenience foods and possibly some that you haven’t thought of for yourself. Just because you don’t feel like prepping, cooking and cleaning or shy away from fresh produce in fear that it will spoil before you eat it all doesn’t mean you can’t still eat some of the healthy foods you enjoy. 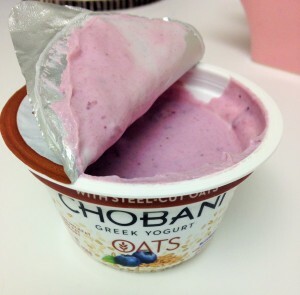 I guess I started thinking about healthy convenience foods after our discussions about the new Chobani Oats. We know that I didn’t love them since I make a better oatmeal yogurt mix on my own but they are still a good option in a pinch. If you like steel-cut oatmeal but never feel like cooking your own like I do every week, did you know that Trader Joe’s sells it ready-made in the frozen aisle? 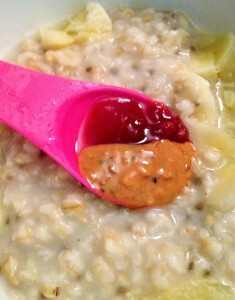 Before I started cooking my own oatmeal servings each week, I lived on this oatmeal. It is delicious. It comes in a frozen individual block and you just microwave it for a couple of minutes. I have mixed my own quinoa and oatmeal for breakfast but never tried the Trader Joe’s version. I am sure it is good. I think that buying the frozen oatmeal set me on my path for making my own. I loved this oatmeal so much but it was $1.49 for two servings. As tasty as it was, I realized I was quite capable of making my own for a lot less money and it really wasn’t all that complicated. However, keeping a box in the freezer is always a good idea just in case. One thing I never make myself is rice. While I cook my own quinoa, rice takes longer and I just love the Brown Rice Medley seen in the above picture (all of the varieties above are terrific). 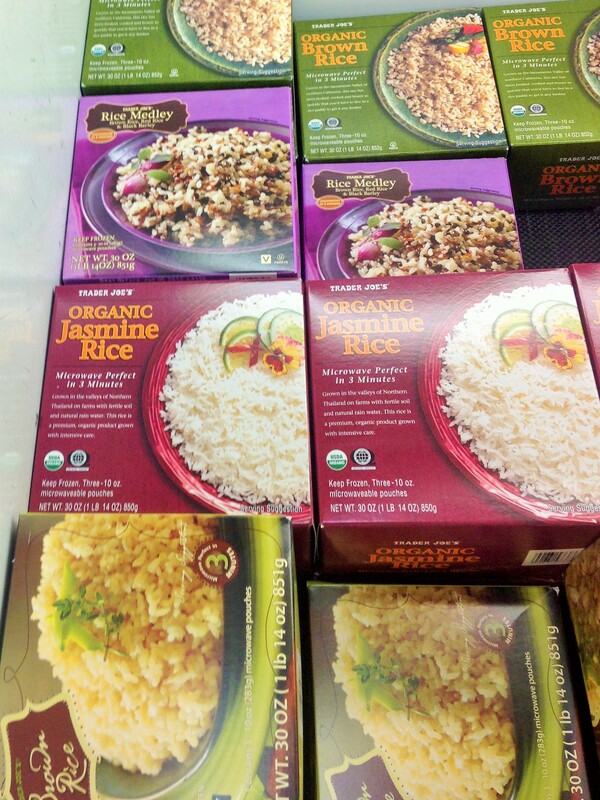 Each box contains three individual bags that easily heat up in the microwave. 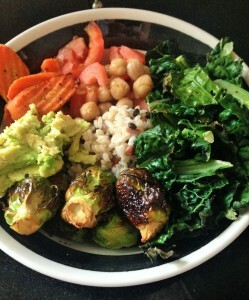 I added the Brown Rice Medley to my lunch Power Bowl yesterday. Also in the bowl went organic chick peas (so convenient from a can), roasted Brussels sprouts, kale, plum tomatoes, roasted carrot chips, avocado and added on top after I took the picture, my old-favorite, Peach Salsa. Salsa is so convenient because it can be used as a dressing, marinade and dip. 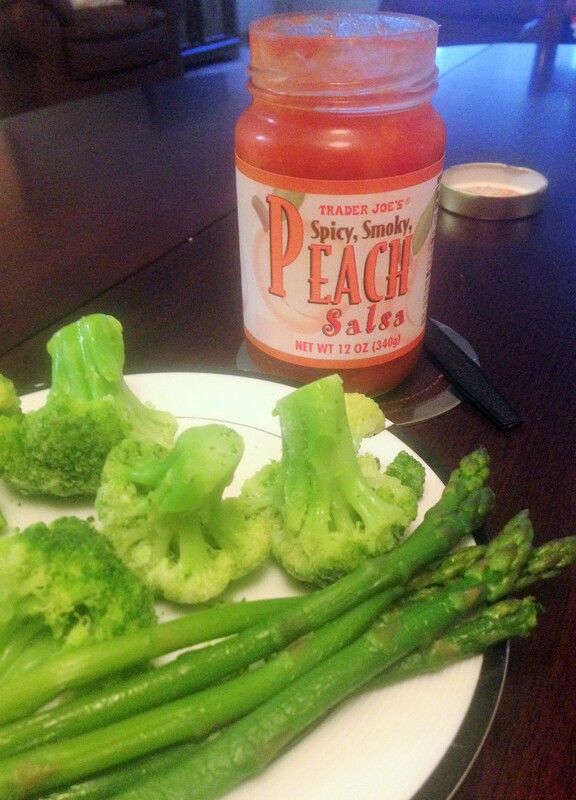 I love the Peach Salsa from Trader Joe’s because it has amazing flavor, a chunky texture, is a bit sweet and the sodium is minimal. Those frozen vegetables seen above are nice and convenient too since you can steam them up whenever you want rather than deal with fresh produce and the pressure of eating it before it goes bad. 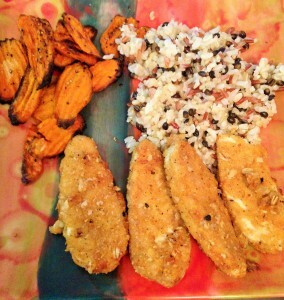 Since I started giving my son more freedom in the kitchen, he has been more willing to accept vegetables on his plate. I thought that the novelty of the carrot chip would be appealing to him if I roasted them up like fries. I normally buy whole organic carrots and peel them myself but the convenience of the carrots already cut into crinkly chips was a necessary purchase this week. All I did was roast a bunch of them in the oven (literally twenty minutes, not even) sprayed with some coconut oil and a sprinkle of pepper. Total convenience meal – Gardein Chickenless Tenders, more of the Brown Rice Medley and roasted carrot chips. The carrots are also delicious roasted with a drop of pure maple syrup as are sweet potatoes. I had forgotten about my lightened up guacamole recipe which is made with sweet peas so I quickly made some last night. 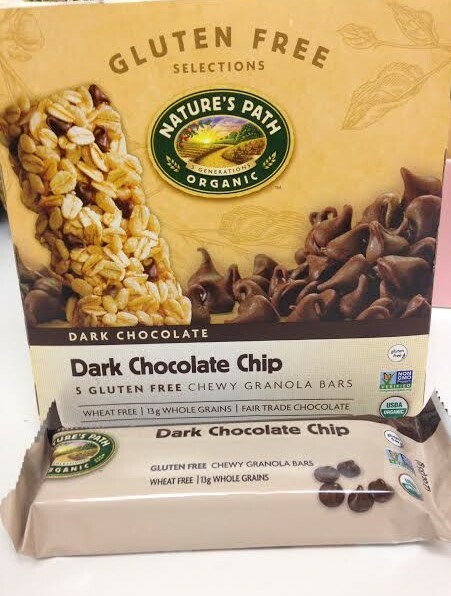 When it comes to snacks and desserts, we all know the convenience of chips and packaged goodies. I am not a chip person so usually if I feel snacky in between meals, I reach for the jar of peanut butter and something to spread it on like apples which to me is always easy and convenient. I like to make my own granola bar snack things but I do buy the packaged kind as well because we need the convenience of wrapped portable snacks for school and activities. 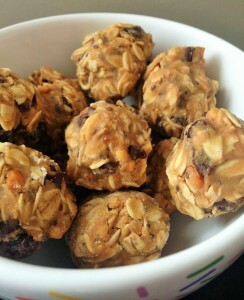 Right now though, snacking is all about a recipe I need to share with you later this week. These bites are just ridiculous, rather healthy, gluten-free, come together real quick and once made, totally convenient and portable. We will discuss the recipe (along with my thoughts on Skoop) by Friday, I promise! Be sure to check out what everyone else is eating today while I go get ready to run inside on the treadmill. It’s raining much harder than I can handle for an outdoor run so it’s time for me to remember how to run indoors. Bleh. Which foods do you buy for convenience? Are you finding berries still at a good price? 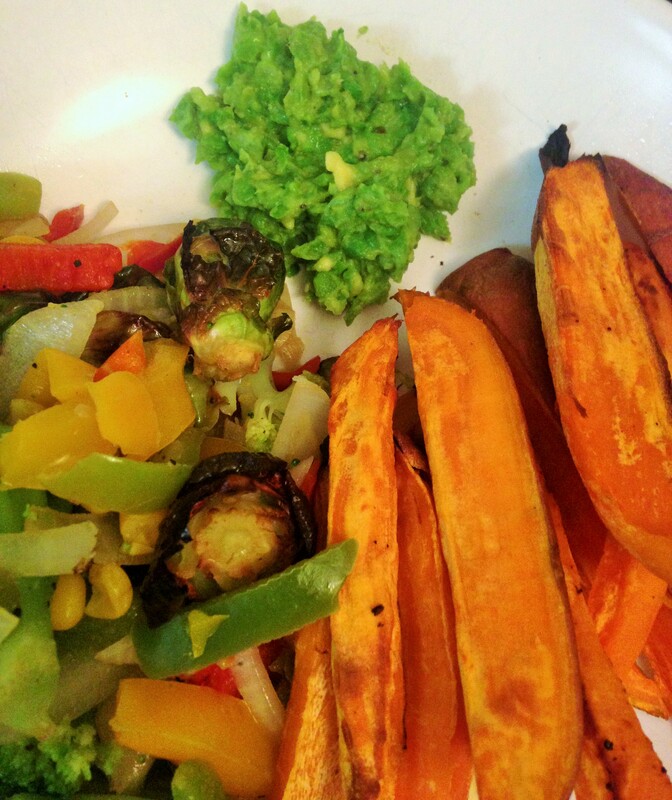 What’s your pre-run meal these days? my ideal pre-run meal is oatmeal, coffee, and a banana. my convenience foods vary. i do tend to favor bagged greens, that i often eat straight from the bag. I am with you on the pre-run meal. For once we are actually winning the cheap fruit lottery here in Chicago (Michigan has a lot of berries). Convenience foods for me at the moment consist of string cheese and preportioned yogurt (rather than buying the plain and then portioning it myself, like usual). Also packaged popcorn. I used to keep burritos in the freezer for the husband, but then he had a few too many of them lol. 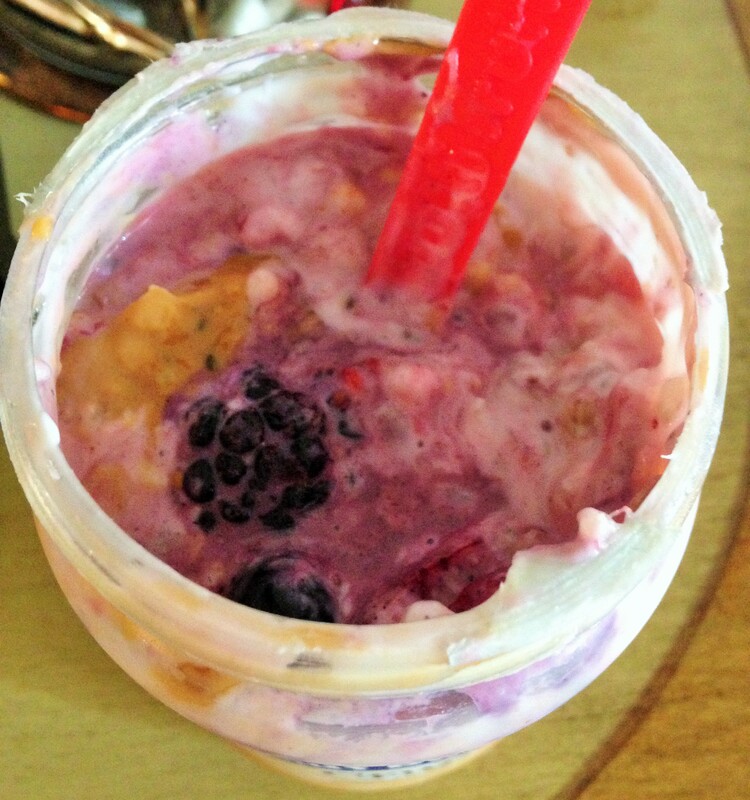 Instant oats (packaged and plain) are great for the road, and staples in emergencies when I am traveling. 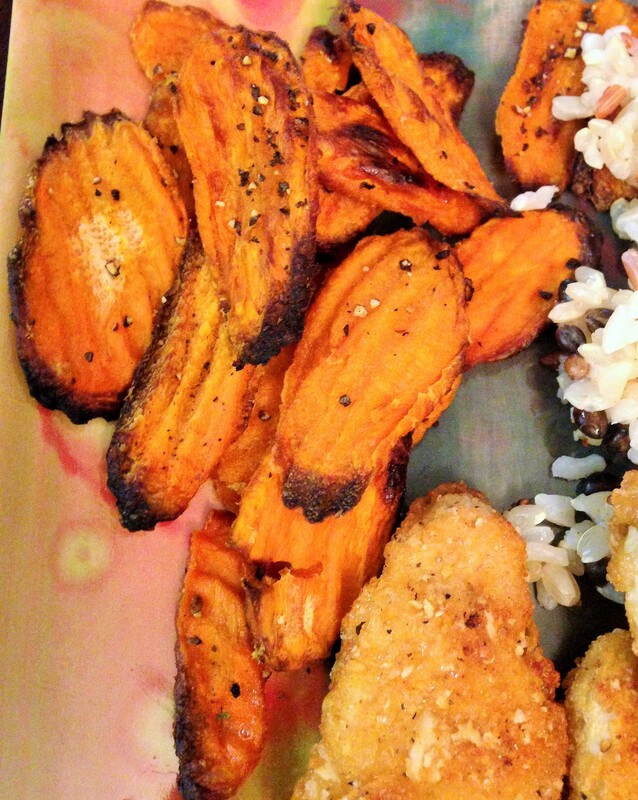 I love the roasted carrot chips idea! Need to do that for sure! Regarding our Hills convo, do you follow Lauren Conrad’s blog? lol. Today she posted about it being 10 years since she was 18 with stuff about Laguna Beach. I thought of you. You know where you can still find good berries at a decent price? Up here in Edmonton… you should come visit! 😛 As for convenience food… hmmmm. Does cereal count? 😆 Because that would definitely make the list. As would a lot of Amy’s frozen pizzas, instant oats for when I travel, dried fruit (it comes in a package!! ), baby carrots, frozen veggies, aaaaand… maybe a few packaged bars to get me through those days where I don’t feel like baking and/or need something different. Well, I do travel for good food, especially good priced food. Oh my – you totally need some convenient things on hand for when the baby comes. I remember being afraid to defrost a package of chicken cutlets in the morning in fear of going into labor during the day and never being able to cook them lol. I think for the last week of my pregnancy, like at the point you are at now (39 weeks), I stopped preparing fresh meals for this fear of food going to waste. Genius idea with the carrot chips! I usually toss together a big ole salad for convenience meals…or eggs…always eggs! You know I am always so honored when you think I have a genius food idea lol. I usually get my berries form TJs because they are waaay cheaper than my local grocery store, especially when bought organic! I also just bought a huge frozen bag of berries from Costco- so cheap! 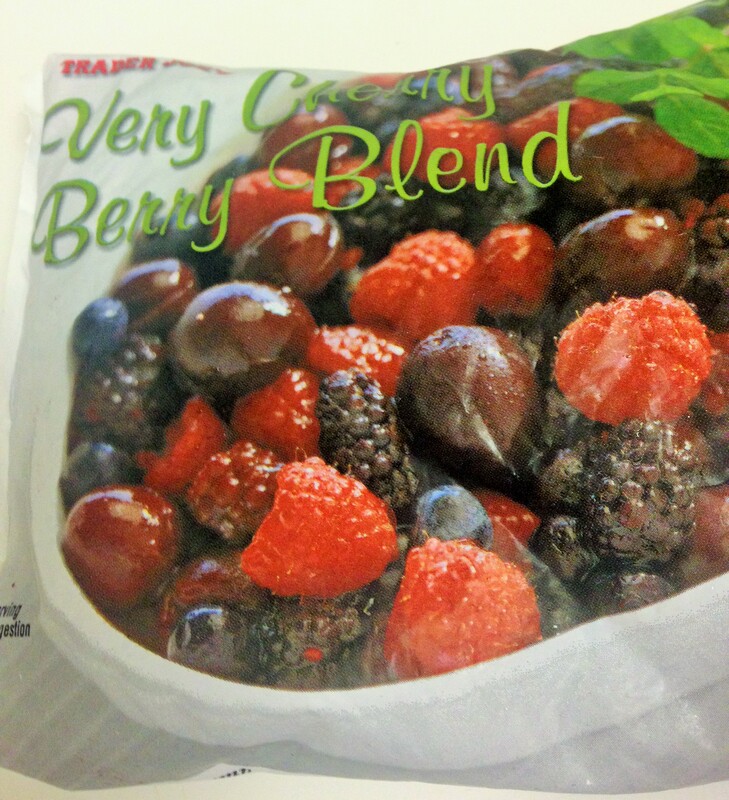 I need to check out the frozen berries at Costco – thanks! Usually I can get cheaper berries at Trader Joe’s but not this week. I have to second the Trader Joe’s peach salsa! It’s delicious! Fruit can be so expensive sometimes…I’m so glad I signed up for a Farm Share at work, it’s been really tasty and affordable! I swear I am crushed over the price of berries this week. Way too pricey especially when we go through a container a day. I love those carrot chips! 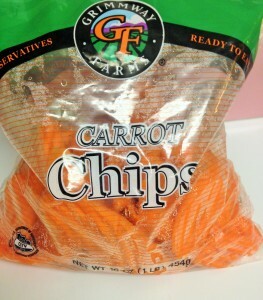 I swear carrots taste better when they’re in chip form. It’s just a fact. I love the carrot chip idea! I tried making green bean chips the other but they didn’t really do it for me. I always have frozen fruits and vegetables on hand. They are very useful when in a bind and I love frozen fruit especially for smoothies. The carrot chips are really good! My son wants them every night with dinner which really says something. Trader Joes has so many convenience items that are actually real food! I thought about trying their quinoa or oats as well (with the new baby) but so far we’re making out okay. 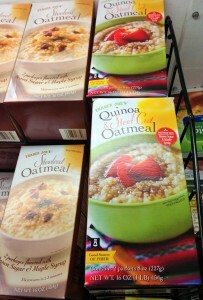 I should pick up a box of the quinoa oatmeal just to see if it is good or any better than what I make at home. Convenience Food to me = WHOLE FOODS. I can stop in and grab something already made 🙂 That is fast food for me! ha! Love Whole Foods. I am due for a trip to the food bar! My Hubby came home with two of the BIG containers of blueberries this weekend because they were 2 for $4, so I immediately went back to the store and bought $20 worth. Gotta stock up while supplies last and before the season ends here. As far as convenience snack foods go, I like fruit or some cheese slices. I’m also a fan of making my own granola and having it all week long. A big old scoop of nut butter helps too. 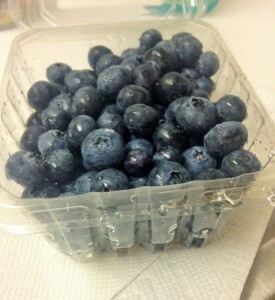 I am really excited right now because my grocery store has blueberries on sale starting Sunday for $1.47 a container! I like your style! I also like that your son is already cooking. That’s huge! My younger brother is 24, and, though he’s active and athletic…his idea of cooking is still throwing a frozen pizza in the oven. He needs to find a woman. 😉 But I’m with you on finding the best deals on food. I spend too much money on food, and I try to avoid pre-packaged foods that I can cook myself. But Trader Joe’s is the way to go. I rarely buy fresh produce, mainly because I fear it will go bad before I eat it. I mostly stick to frozen fruits and veggies so I don’t have to worry about spoilage. My one convenience snack that I can’t make myself but I HATE buying…is Quest Bars. I love them. But they are ridiculous. I order them by the box to save $12, but it’s still $2 a bar. Painful, but I love them. I just buy frozen berries for smoothies.And my pre-run/workout snack is my beloved Quest Bar that I eat around 3pm at work before my 5pm workout. I feel best working out on an almost empty stomach, so by then I’ve got reserves for fuel but not too much to upset my tum tum. Mary Legare Whaley recently posted…Recap: The Races I didn’t Blog About this year. Quest Bars are a small fortune so I try to save them for emergencies. I was eating them more several months back but gave them up for now. My wallet is happy about it!